... as releases No. 9, 10 and 11 will be unleashed upon you! 35 years after coming into existence for the very first time in 1983 the franco-canadian thrashers EUDOXIS have now decided to re-release all their previous and long sold out albums – the “Attack From Above-EP” (1986) and the full length “Open Fire” (1991) - on a special anniversary-compilation. The songlist is completed by two new tunes (2017/18) by the new formed follow up-band Screen with four of the ex-members. Await some original and very intense thrash metal-tunes from the early canadian metal-days. With the split “Death For Our Rivals” Ragnarök presents a thrash metal-assault that was originally released by californian Nero One-records on tape only. As there has been a big demand to release this on CD, we are proud to announce the release of this masterpiece for the first time on CD. 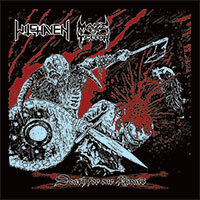 Witchaven (San Bernardino, California) and Maze Of Terror (Lima, Peru) are two of the most zealousy, agile and popular underground acts worldwide. Please welcome StormThrash onboard of Ragnarök Records and make sure not to miss this true masterpiece! Our european pressing contains – compared to the japanese version – two bonus tracks. 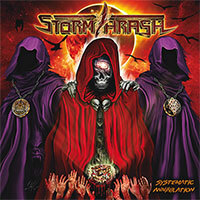 Stormthrash is a fascinating newcomer and their debut-full length “Systematic Annihilation” will be hard to top for any thrash act in 2018! Look at releases and bands to get more informations about them and make sure to visit the shop to buy those items!